Journalists are often warned about the perils of getting emotionally involved with stories and subjects, but when reporting on a tragedy there’s always room to act as a human being first and a reporter second. Reporting on the pain of the small college town of Blacksburg, Va., after the horrific 2007 shootings at Virginia Tech, my natural instinct was to grieve with the folks there. At the time, though, I didn’t know how to use my emotions as a compass to help me connect with people I needed to interview. But six years later, I know that for journalists in such terrible situations our humanity is a strength, not a weakness. Bill Leukhardt, a reporter with the Hartford Courant, has seen tragedy from both sides. His stepdaughter, Lauren Rousseau, was one of the teachers killed at Sandy Hook Elementary School in Newtown, Conn., on Dec. 14. Leukhardt, whose wife is also a journalist, said during a recent symposium at Columbia University dealing with breaking news, trauma and the aftermath that they understood why they received so many media inquiries after their stepdaughter’s death. But that didn’t make it any easier to open up for interviews. The symposium was presented by Columbia Journalism School’s Tow Center for Digital Journalism and the Dart Center for Journalism and Trauma on Monday in New York City for an audience of mostly working journalists and journalism students. Leukhardt and many other panelists had an overarching message for reporters speaking to the grieving: show compassion and acknowledge loss. In its annual assessment of journalists killed worldwide, the Committee to Protect Journalists (CPJ) says 70 journalists were killed in 2012. The New York-based press freedom organization categorizes murders as those with a confirmed motive, those with unconfirmed motives, and the death of media workers (employed in the industry but not reporting the news directly). According to CPJ statistics there were 31 additional murders in 2012 that they have been unable to confirm the motive for, and 2 additional deaths that were media workers. It’s impossible to ignore that there is a very bizarre, inherent bias in the media world against journalists who are not western. I first noticed it when I started trying to do a story about the dangers and difficulties that Arab journalists face working in Gaza and the West Bank. Nobody was interested except for Arab publications. In a similar vein, it’s interesting that western media haven’t yet picked up the story about a Jordanian journalist and his local crew working in the Philippines who might have been kidnapped. Different local media have covered the story, with widely conflicting takes on what has happened to the reporter, Baker Atyani, and his crew. Atyani works for Al-Arabiya TV. Even if it turns out that the group was not kidnapped, and are simply off the radar because they are working on a story, it’s curious that mainstream western media hasn’t made a mention of it. It makes me suspicious there might be an inherent bias against giving too much play to stories involving the work–and plight–of Arab journalists. LA Times photographer Michael Robinson Chavez shares on Facebook that some work he did on Peruvian gold mines was honored with the Robert F. Kennedy Award for Journalism. It was fantastic to get a phone call from Ms. Ethel Kennedy! You can see the work on the following link. Also sending congrats to my colleague Katie Falkenberg who also won an RFK award for her work on families dealing with the recession, an LA Times sweep! A pilot program agreement between Minnesota and the federal government may ensure cleaner waterways, but will come at a price. A Memorandum of Understanding between Minnesota, the U.S. Department of Agriculture (USDA), and the Environmental Protection Agency (EPA), aims to establish a program to reward members of the agriculture industry who agree to meet certain water protection standards. The voluntary program will give farm operators who adopt practices from the Clean Water Act (CWA) an exemption from future state and federal water quality standards for a certain period of time. The exemption period could last as long as 10 years. The CWA regulates pollutant discharges into U.S. waters and quality standards for surface waters. For the last few years, a blogger in Russia has been using the written word to motivate political change. 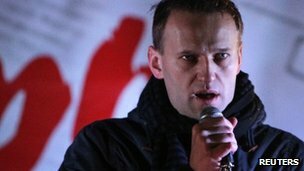 Alexei Navalny, who is a lawyer by day and blogs in his spare time, helped affect the outcome of a recent election. Read more about Navalny here. Navalny is seen here in a Reuters photo.